You can sign up to become a Healthy Mummy advocate through our new Refer-a-Friend Reward Program. You sign up to the program, and you will receive your own unique URL which can you share with your friends. When your friends click on this link, they will be shown a coupon code that gives them an exclusive discount code that they can use in our online store. 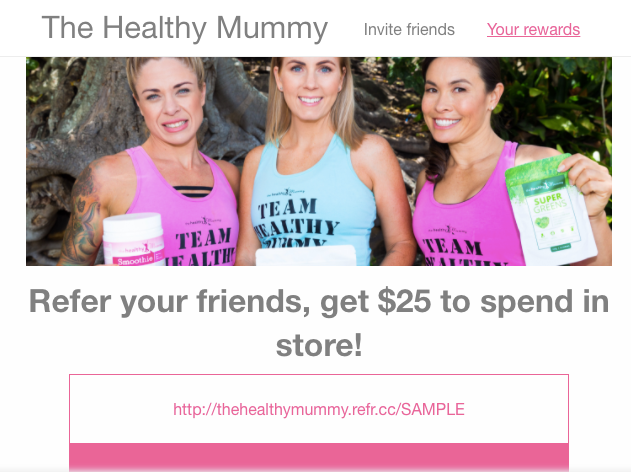 When they go to the Healthy Mummy store to make a purchase, they use that code, and then you will receive an email to let you know that a friend of your has made a purchase. Then you will receive a reward, delivered straight to your inbox. Codes can be used on any physical, mail order item in the store. They cannot be used on digital items including the 28 Day Weight Loss Challenge, subscriptions or eBooks. They cannot be used in conjunction with other promotions, or on sale items. How do I manage my advocate account? You can log into your account and check your reward status at any time by clicking on the 'Your rewards' link on the unique sharing page you received when you signed up.